In Maine, and especially in our seacoast village of Boothbay Harbor, there is a rapidly growing culinary scene. We would like to welcome you to our area so you can taste some of the fine cuisine available here, like fresh seafood from the Boothbay Lobster Wharf. This spot along the harbor is an actual working wharf that doubles as a local restaurant. 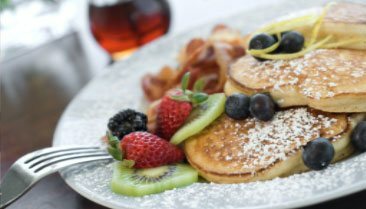 Here, you will find classic Maine foods that have become popular with visitors and locals alike. To taste the wonderful meals at Boothbay Lobster Wharf, we encourage you to take a trip to Boothbay Harbor. In fact, you can easily make an extended stay out of it. There’s so much to do here! Request your free Vacation Guide today for detailed information on the best activities, unique shops, restaurants, and more. 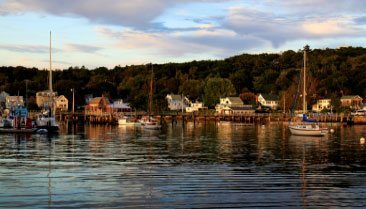 This helpful resource will make your planning process a breeze so you can get here sooner and experience all the things that make Boothbay Harbor an attraction in itself. Of course, when you’re in Maine, you need to try some of our famously fresh Maine lobsters. There are numerous places you can find it, like Shannon’s Unshelled and the Boothbay Lobster Wharf. At the Wharf, you are able to choose from many lunch and dinner options on the menu including their famous lobster rolls. The seafood here is some of the freshest boat-to-table fare you can find. Once you arrive, be sure to take a look at the saltwater tank where you can hand-select your own lobster. The Boothbay Lobster Wharf specializes in much more than just lobster, though. Be sure to try one of their many other offerings, like steamed clams or fish sandwiches. They even have a retail fish market if you’d like to take a fresh catch home. The market is open seven days per week. Fresh food isn’t the only thing that draws customers to the Wharf. The restaurant creates a unique atmosphere with entertainment and events. During the summer, listen to great live music while enjoying your meal. You can eat, drink, and be merry with a fully stocked bar inside. Or, attend the Buck-o-Shuck oysters event every Friday after 6 p.m. Whether you are a visitor or a local looking to grab a drink and meet great people, you can stop by the Boothbay Lobster Wharf for happy hour and take advantage of great deals from 4 to 6 p.m. In addition to delicious food and fun events, the Boothbay Lobster Wharf offers scenic surroundings. Enjoy classic Maine foods while marveling at the views along the harbor. While you can always choose inside seating, the wharf offers the option to sit outside on a covered deck. Gaze out into the water and watch the boats travel by. Whether our famous seafood attracts you here, or our scenic environment and fun activities do, we welcome you to Topside Inn for the best Boothbay Harbor lodging. Our 19th century Sea Captain’s home is located atop Mckown Hill at the highest point in town, offering panoramic views of the area. Each of our 23 guest rooms are uniquely decorated and feature luxurious amenities. Consider Room #3 in the Main House for your stay. 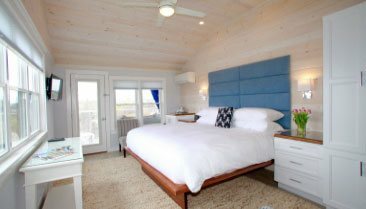 This room boasts a queen bed, remarkable views of the harbor, and a large, private bathroom. We even offer afternoon cookies and treats, hors d’oeuvres and drinks for cocktail hour, and 24-hour access to our guest kitchen. We look forward to welcoming you to our boutique hotel! 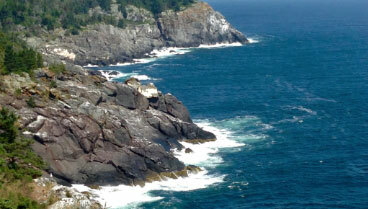 Check our availability and book your Maine getaway today.